I have to be at the Asmara railway station at 8:00. 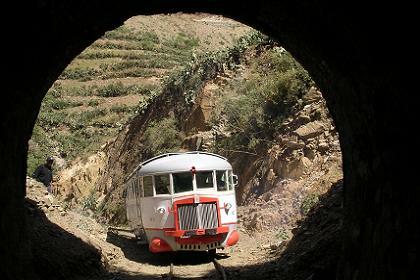 Globesteam organizes a program this week, chartering both steam and diesel trains of the Eritrean railways, for railway fans from all over the world. I will participate in today's program, a trip with an Italian railcar, called Littorina, from Asmara to Ghinda. I decide to take the number one bus to the railway station. If I take a taxi, I will be there to early, and it is quite common that the rest of the group is to late. An Eritrean man in the bus is standing next to me, carrying a book about football, in German, so I say to him "Wenn Sie Deutsch lesen können, erwarte ich dass Sie auch Deutsch sprechen können." He is surprised. He tells me he lived 16 years in Germany, and returned to Eritrea two years ago, now teaching gymnastics. We both leave the bus at the bus stop closest to the railway station. He shows me the direction. "Second street on the right, and then straight on for 300 meters." Even before it is eight o'clock, I am at the railway station. None of the other railway fans arrived yet. When I enter the yard of the railway station, I have to pass the offices of the Transhorn Company. A woman approaches me with great enthusiasm. "Do you remember me? We danced together four months ago". It takes a few seconds before I realize who she is. It is Beletu Tareke. I recognize the smaller details in her face, and pleasant memories of the celebrations of 13th Independence Day in Medeber pass my mind. Beletu asks me if I brought her picture. I didn't, because I judged the chance to find her back close to zero. I tell her that I didn't expect to see her ever again. "But next time I will bring you copy, when we will celebrate 14th Independence Day". She tells me I have to come back to her office after the trip with the Littorina. Shortly after 8:00 Peter Patt and the other rail fans enter the yard. Provisions are loaded on the train. Lots of mineral water and Coca Cola. Peter Patt, the tour-conductor, is directing his group to the best positions to picture the railway equipment and its surroundings. We climb the water tanks above the tracks, and the Littorina is positioned in front of the railway station. 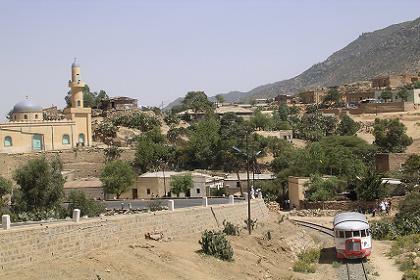 A few hundred meters from the Asmara railway station the Littoria poses in the scenic landscape. At 9:00 the railcar is departing Asmara for the trip to Ghinda. 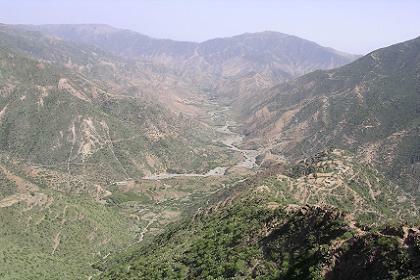 The section between Asmara and Nefasit is the most spectacular. 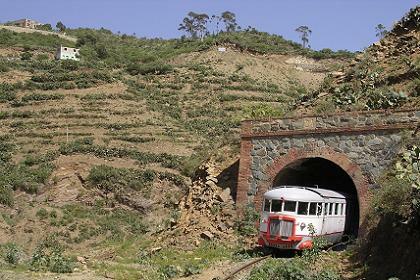 More than 20 tunnels, 65 bridges and an incline of 1:30, make the journey on this railway one of the greatest traveling pleasures in Eritrea, and the picturesque views makes it one of the most beautiful railway journeys in the world. Spending over three hours onboard allowed us to observe life in Eritrea from an another perspective. The train halts several times at the most idyllic spots. Tedros Kebbede, accompanying the tour on behalf of Travel House International, translates Peter Patt's instructions to the driver of the railcar. The German, Austrian, Canadian, American and Dutch passengers take strategic positions in the hills to picture the train as it passes below us. Back on board drinks and sandwiches are served by the two Eritrean hostesses. 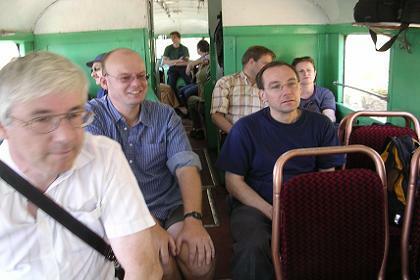 When the Littorina passes small villages, children gather around the train and wave their hands to us. In one of the tunnels the railcar has to make an emergency stop when a cow is walking on the track. At 13:00 we reach Ghinda railway station. Ghinda hosts one of the three railway depots. Locomotives, maintenance cars, carriages, water supply equipment for the steam locomotives, workshops. 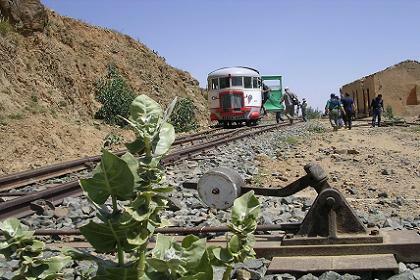 The photographers do their best to record all aspects of the Eritrean railway. Peter Patts group will continue their trip by mini bus to Massawa. Their program will continue the whole week, using different railway equipment every day, experiencing the whole line up to Massawa in two directions. I will return to Asmara, using a public bus. In BBRSSY donut house I buy two excellent donuts. Terhas' pizzeria will not serve any pizza's until 18:30. I ask the owner of the pastry what the name BBRSSY is supposed to mean. He tells me every character represents one member of the family. "B for Bereket, that's me, B for Belainesh, my wife, R for Rafael, S for Senait, S for Samrawit and Y for Yohannes, my four children makes BBRSSY!" I stroll the streets of Asmara until sundown, trying to discover more of its many little treasures. Asmara is now officially declared the capital of Art Deco, although some of the buildings need a new layer of stucco. Hundreds of palm trees, bougainvillea and giant cactus trees complete the scenic beauty of Asmara. Women in beautiful colored clothes, their hair plaited in fine strands very close to the scalp, men in neat jackets or in suites hanging loosely on their body as if the tailor made them just to large. Nothing suggests you are walking in on of the poorest countries of the world. Despite their limited recourses, Eritreans are always neatly dressed and even in this dusty climate they are able to keep them incredibly clean. When the ovens of Terhas' Pizzeria Eritrea are heated, I order myself one of her delicious pizza's. Number ten, "aserte" is my favorite. We decide to picture it, with Bisrat and me. Terhas makes a tour through the pizzeria, picturing all the women at work. When I have finished my pizza, I spend the rest of the evening in Selas bar with Tesfai and Freweini and their guests. 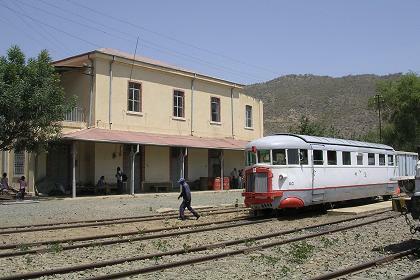 Littorina at the Asmara railway station - Asmara Eritrea. 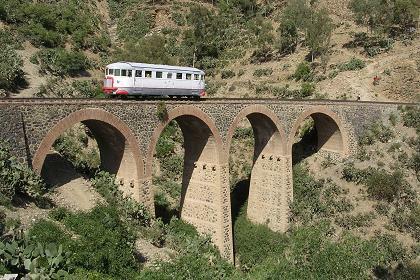 Littorina passing a bridge between Asmara and Nefasit. Scenic view from the Littorina. Littorina entering one of the many tunnels. Interior of the Littorina. Peter Patt (smiling) and his railway fans. Littorina passing one of the many tunnels. 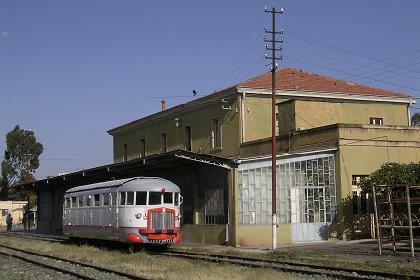 Littorina at one of the former railway stations near Nefasit. Littorina at the railway station in Ghinda. 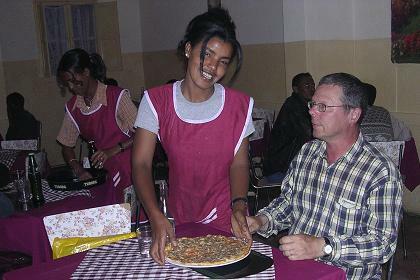 Bisrat serving my pizza - Pizzeria Eritrea - Asmara Eritrea.